The rail transport part of the industrial revolution in Europe started in 1825, when the Stockton and Darlington Railway in north-east England opened as the first public steam railway in the world. 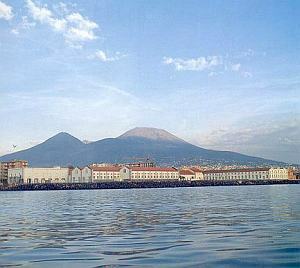 The first railway to open in Italy was in the eastern suburbs of Naples in October, 1839 (see this link). (This Naples-Portici line narrowly beat out the Milano-Monza line that opened in August of 1840.) It is worth noting that the locomotives, carriages and tracks of the first Naples railway were not built in Naples but rather by a French company, and for a while all the rolling stock was imported. Then, the Neapolitan monarch, king Ferdinand II, decided to free the kingdom from foreign dependence in this brave new age of the train and declared in 1840 that a Royal Foundry be built in the eastern Neapolitan suburb of San Giovanni a Teduccio, precisely at a spot named Pietrarsa. The etymology is interesting; the spot was originally called Pietrabianca—White Rock, but the great explosive eruption of nearby Vesuvius (photo, below) in 1631 sent lava out as far as White Rock, turning it into Pietrarsa —Burnt or Scorched Rock. At first, the stated goal of the plant was to produce metal for both wartime and civilian use, employing ore and materials from the iron foundry in Mongiana in Calabria, a facility dating back 1770. Then, in 1843, Ferdinand decreed that the new facility at Pietrarsa would also build and maintain steam locomotives, train carriages and tracks with the goal of building a railway line from Naples to Capua. Accordingly, the first project was undertaken in 1844, consisting of repairing two steam locomotives, the Impavido and the Aligeri, originally built in England. In 1845 production started on home-grown locomotives with some of the components, however, still being imported from Britain. 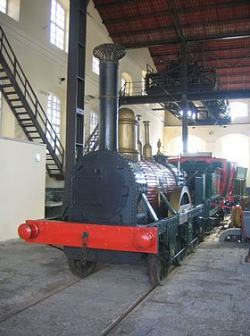 By the 1850s, however, the Pietrarsa foundry was making its own boilers and steam engines for locomotives and ships, building the locomotives, themselves, as well as the carriages and tracks; it was, in fact, one of only two factories on the Italian peninsula to make steam locomotives. It also made artillery pieces. In 1853, the plant had 700 employees. The plant had become independent of foreign rolling stock. Pietrarsa also received some prominent visitors such as Czar Nicolas I of Russia who eyed the plant as a model for his own foundry in Kronstadt. By June of 1860, the Pietrarsa foundry had 1125 employees. It also had 75 cannoneers standing by, protecting what was now the largest facility of its kind in Italy. The assimilation of the kingdom of Naples into the new nation state of Italy in 1861 meant the beginning of economic decline for many sectors in southern Italy, and Pietrarsa was no exception. The plant was leased to northern interests in the 1860s, workers were laid off, and there were strikes and confrontations with the police. Yet the plant remained in operation and in the 1870s was still a vital part of the Italian production of steam boilers for trains and ships, this in spite of the great reduction in the work force at Pietrarsa (down to 100). Between 1877 and 1885, the facility turned out 110 locomotives, 800 freight cars and 300 passenger cars. The Pietrarsa facility was incorporated into a larger national corporation in 1905. The advent of newer electric railway systems led to the gradual but inevitable obsolescence of the facility. Pietrarsa made its last locomotive in 1975. In 1989 it opened as a railway museum, was then closed again for repairs and finally opened again in 2007. The facility is 36,000 sq. meters in area (about nine acres) and is set right at the water's edge (photo, left). It is long and white and quite noticeable from the sea. The museum, itself, is magnificent, and the grounds are pleasant and not a bad place at all to look at the water when you get tired of trains.